Canada's 6-3 win was far from easy, but Canada now has gone a perfect 15-0 in the three world junior tournaments affected by an NHL lockout. Here are five matters from Canada's second win in Ufa, Russia on Friday. A desperate Canadian junior team survived a Slovakian scare in its second game at the 2013 World Under-20 Championship on Friday and because of another suspension they will face the United States with only 11 forwards on Sunday. The Canadians survived a horrible opening 30 minutes to score a 6-3 come-from-behind victory. They clearly didn't believe what they saw two days earlier when a pesky Slovakia managed to push the host Russians to overtime only to lose 3-2. Five-minute majors and game misconducts to Canadian forwards J.C. Lipon, in the first period, and Anthony Camara in the second period were causes for early concern. Lipon was suspended one game for his hit to the head. Slovakia scored a power-play goal during each major penalty. The second was with Canada facing a 5-on-3 disadvantage and gave Slovakia a 3-1 lead with less than 30 minutes remaining in the game. The final goal from Slovakia was the wake-up call Canada needed. Even though they were down to 10 forwards, the Canadians finally started to speed up their game with pinpoint puck movement to put their opponents back on their heels. Canada now has gone a perfect 15-0 in the three world junior tournaments affected by a NHL lockout. 1. Canada already has been without third-line centre and returnee Boone Jenner. He served the second of a three-game suspension for a late hit in an exhibition game against Sweden last Saturday and isn't eligible to return until Canada's last robin-round game against Russia on Monday. Because Jenner and Lipon spend time killing penalties, Canada will want to be ultra-disciplined against the U.S.
2. How did I see the two hits? I felt Lipon deserved a five-minute major and game misconduct, but did not feel he warranted the one-game suspension. But the IIHF usually tacks on an extra game with these sort of five-minute major and game misconduct penalties. Lipon, a forward with the Kamloops Blazers, definitely elbowed his opponent in the head and was worthy of his checking to the head infraction. Camara, a Boston Bruins prospect from the Barrie Colts, did not deserve his penalty from a CHL or NHL perspective. But this obviously is a tournament under IIHF rules. Still, Camara's hit wasn't a charging major as called well after the fact by Czech referee Pavel Hodek and his Finnish officiating partner Jari Levonen. With the advantage of slow-motion replay, Camara's shoulder hit Slovakia defenceman Patrik Luza. Camara claimed afterward that an on-ice official told him his hit was clean. But even incidental contact is a no-no under IIHF rules. He should have been penalized for a head check. IIHF checking to the head and neck area rule 540 states, "A player who directs a check or blow, with any part of his body, to the head and neck area of an opposing player or 'drives' or 'forces' the head of an opposing player into the protective glass or boards, shall be assessed at the discretion of the referee, a minor and a misconduct penalty; a major and game misconduct penalty; or a match penalty. When injury occurs, a match penalty must be assessed. Since the Camara hit was called charging and not a head check on the ice, it would have been hard for the IIHF to levy supplementary discipline to the Canadian forward. Luza had his head down, but Camara did not charge at him. 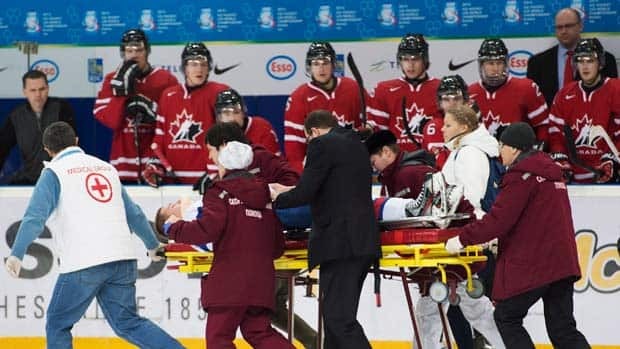 He was gliding when he floored his opponent, who was cut from his visor, taken off the ice on a stretcher and hospitalized for precautionary measures after he suffered a concussion. 3. Often frustrated by embellishments from opposing players in international play, both Canadian forward Mark Scheifele and defenceman Doug Hamilton drew penalties with drama skills of their own in the second period that resulted in power-play goals. It's not a habit the Canadian kids want to get into, but the flops certainly played a role in Canada's turnaround on Friday. 4. Scheifele was knocked down and battered in this game, but the Winnipeg Jets prospect was a force. He scored the go-ahead goal in the final minute of the second period and continued to exhibit his move to right wing has been seamless. His Barrie Colts coach Dale Hawerchuk, who also moved from centre to wing for Canada in various international tournaments (see 1987 Canada Cup) helped Scheifele with the adjustment in practice earlier this month. 5. Canadian defencemen Morgan Rielly (a goal and two assists) and Xavier Ouellet (two assists) were lauded for their offensive contributions, but London Knights blue-liner Scott Harrington continued to be Canada's steadiest defenceman in his own end. His teammates recognized his effort against Slovakia. He was awarded the Canadian cape after the game as the team's internal MVP.